VP914 for for Canon and Telefunken BP-911 BP-914 BP-915 BP-924 BP-927 BP-930 BP-941 Li-Ion. Camcorder battery. Type: Lithium-Ion. Voltage: 7.2 V. Capacity: 2000 mAh. Height: 70 mm. Width: 37.8 mm. Depth: 20.5 mm. Also replaces: Canon BP-911, BP-914, BP-915, BP-924, BP-927, BP-930, BP-941, BP-945. The VP914L is an equivalent to many other batteries. Click here for details. 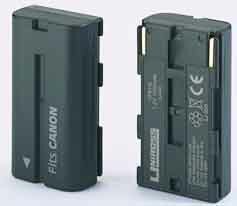 This VP914L (Canon BP-914 or BP914 replacement battery) Lithium-Ion Digital camera battery fits some Canon and Telefunken camcorders. TELEFUNKEN G10HI, G1500, GL1, XM1. This Canon BP-914 or BP914 replacement battery comes with a two year manufacturer's warranty.